When you notice the water in your shower or bathtub is not flowing down your drain easily, you might be tempted to call the plumber. Slow drains are caused by clogs created by soap buildup, hair, and other gunk blocking the drain. However, you don’t need to call the plumber right away, as you do have options available to you to address slow shower drains before you rack up a plumber bill. 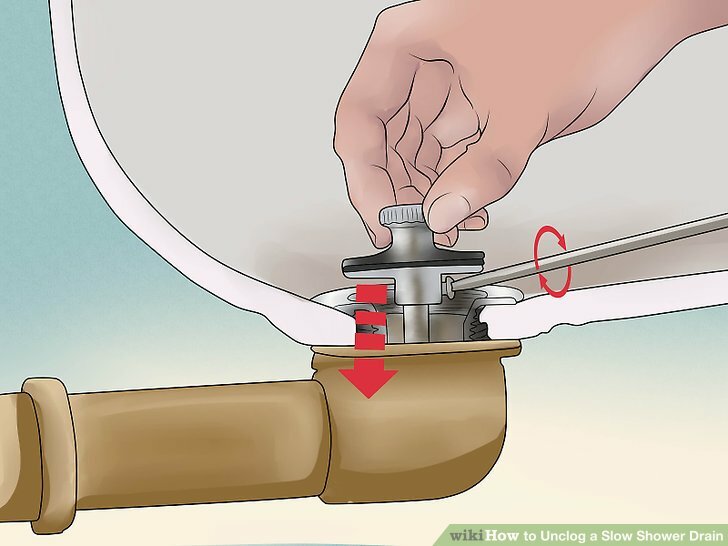 Remove the stopper from the drain. Most drains are easy enough to unclog with either your hand, a wire, or clothes hanger. However, you first need to figure out how to release the stopper. Most drains are either drop stoppers or push/lock drain stoppers. To release a drop stopper, first lift it up slightly. It should have screw that sticks up a little. Simply turn the screw a bit to make it looser, then lift the stopper up. For the push/lock drain stopper, first push down once like you are going to stop up the drain. Push it again to unlock it. Once it is unlocked, you should be able to unscrew the whole stopper and then pull it out. In a shower, you may need to just lift up the strainer at the bottom. You may also need to unscrew the grating. Create the tool you need. While you can remove some clogs with your hand, it will be easier, more effective, and less disgusting to use a tool. You can start with either a wire coat hanger or a piece of stiff wire, but you need to do a bit of preparation either way. 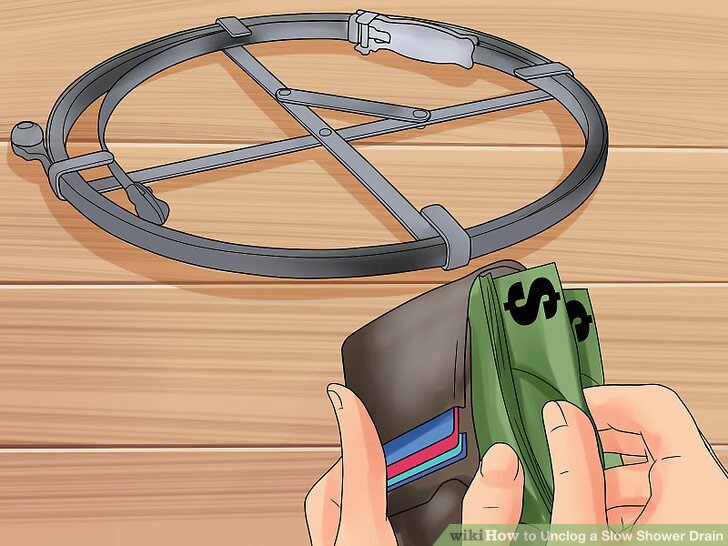 For the coat hanger, straighten it out into a long wire. Bend the end of it with pliers so it makes a smaller hook that will fit down your drain. For the wire, just bend the end in a little hook to catch the hair. 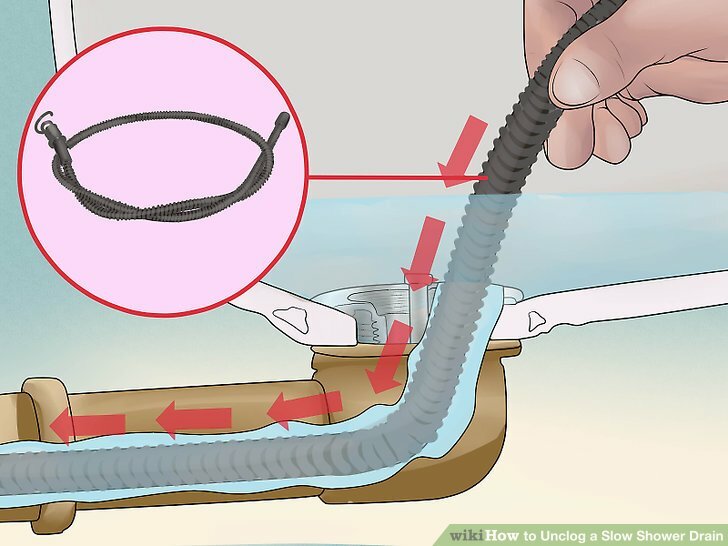 Remove the clog from the drain. With the bent wire, hook the clogged hair by shoving it through the clog. Use it to pull up the clog out of the drain, then throw the hair away. You may need to dip down more than once to get all the hair. 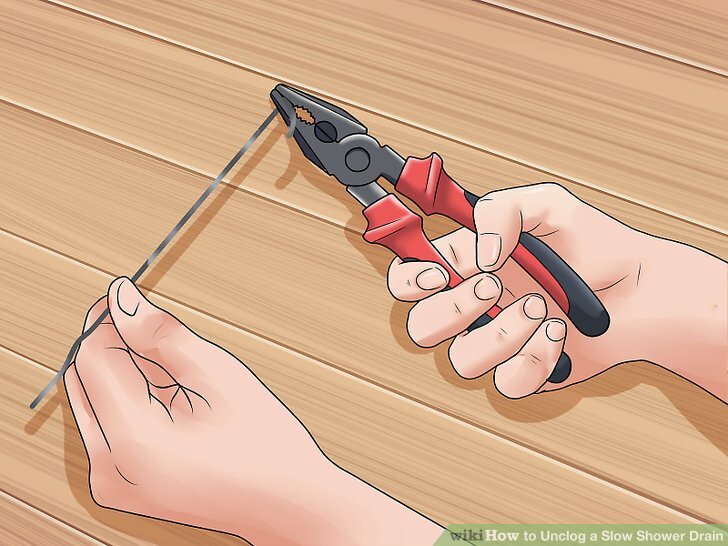 If the hair is particularly stubborn, you may need to use a utility knife to cut it. As you pull the hair up, slice through the middle so you don’t need to untangle it. Put the stopper back in. Once you are sure all the hair is gone, check to see if the shower is draining properly again. If it is, put the stopper back in the drain. 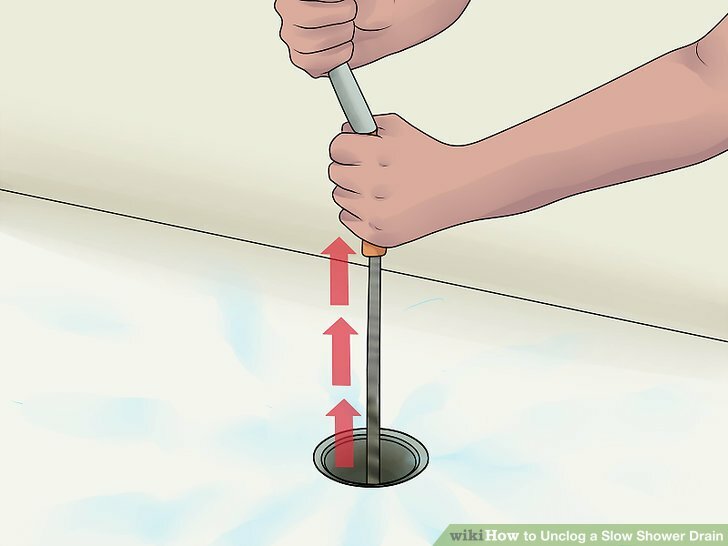 You’ll need to screw the whole push/lock stopper back into place, while for the drop stopper, you’ll just need to screw in the middle shaft. If it’s not draining properly, you’ll need to move on to other options. Using a chemical drain cleaner. 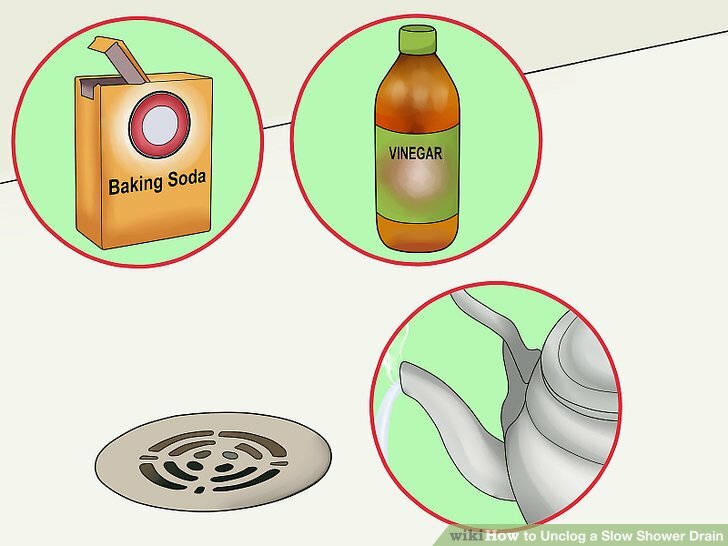 Products like gel cleaners and other types of commercial drain cleaners can help you remove clogs from your drain. However, you do need to be careful with these products, as they are very strong, and they can damage your pipes or cause problems if you don’t use them properly. Always read the bottle to make sure the product you have can be used on the types of pipes you have and the system you have. For instance, you may need a special product for a septic system. In addition, make sure you buy one appropriate for baths and showers. 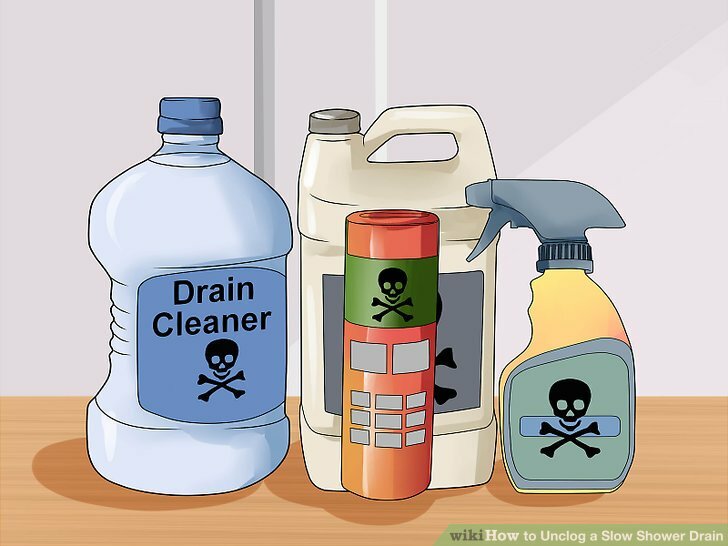 Never mix more than one type of drain cleaner. For instance, if the clog doesn’t move, you don’t want to pour another kind on top. That can lead to toxic fumes, which can cause you health problems. 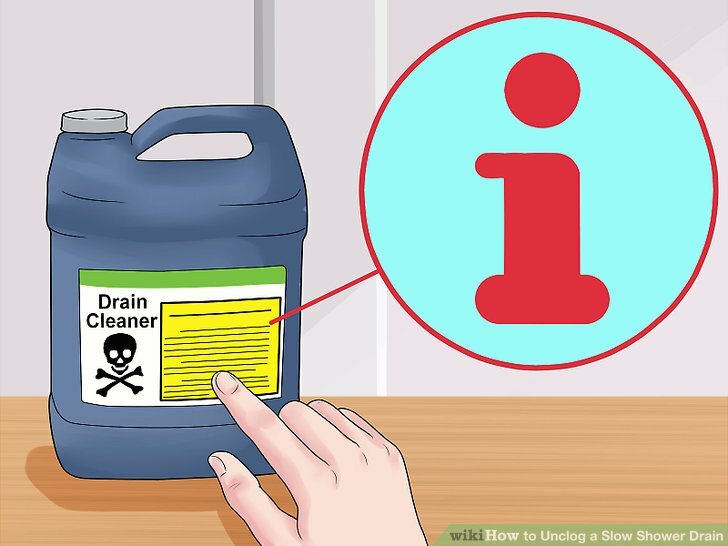 Each drain cleaner will work a little bit differently, so it’s important to read the instructions first. Make sure you are following the instructions to the letter because drain cleaners are powerful chemicals and they can be harmful. Start with what you need. Generally, you start with about half a bottle to try to remove the clog, and then you wait a specified period, usually about 15 minutes. Use the whole bottle if it’s not draining at all and half if it’s draining a little bit. Usually, you can pour the cleaner through standing water but not always. Run hot water down the drain afterwards. After waiting the required time, you need to use hot water to clear the chemicals and the clog. Watch to see if it’s draining properly. If it’s not, you may need to try again with some more of the same drain cleaner. Make sure you don’t try a different cleaner. 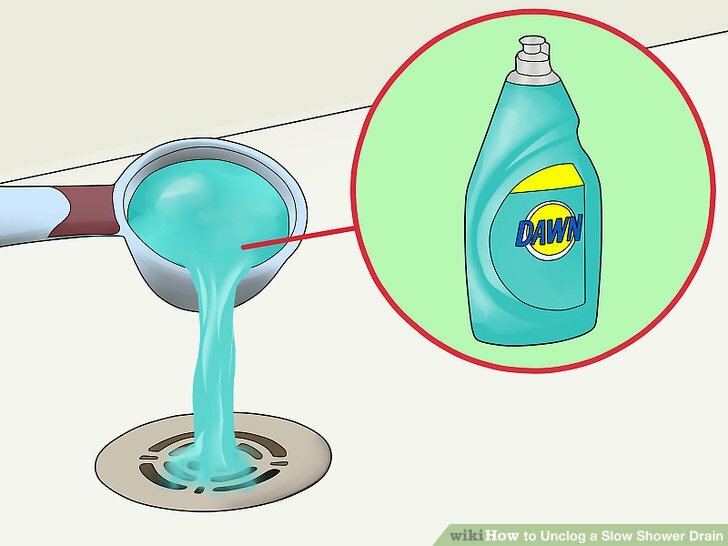 Pour 1 cup of Dawn liquid dish detergent, or any enzyme-based liquid dish soap, into your shower drain. Let it sit for at least an hour and then flush the drain with hot water from the tap. This solution can create a large amount of suds, so be careful. One natural solution that will get some slow drains unclogged is boiling water. If the water is still standing in your shower, let it drain out. 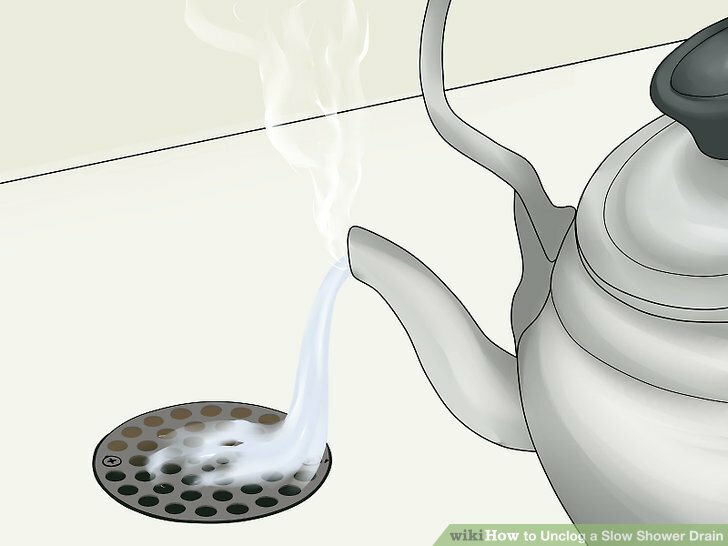 Boil some water, and then slowly pour it down the drain, which will help move some minor blockages along. If you have regular PVC pipes, boiling water could damage the pipes. However, if you have metal or CPVC pipes (which can take higher temperatures), using boiling water should be fine. However, according to most city codes, you should have metal or CVPC, not PVC. Try vinegar, baking soda, and hot water. Another option for a natural solution is vinegar, baking soda, and hot water. These ingredients can help break up the clog when used in conjunction with each other, though you may not want to mix these solutions with chemical clog cleaners. Start by pouring a single cup of baking soda down the drain, followed by 2 cups of boiling water. Once you’ve given that about five minutes, follow it up with a baking soda-vinegar combo. Pour a cup of baking soda down the drain. With the stopper ready to go in, pour in a cup of vinegar. Stop up the drain, and let the baking soda and vinegar foam together. 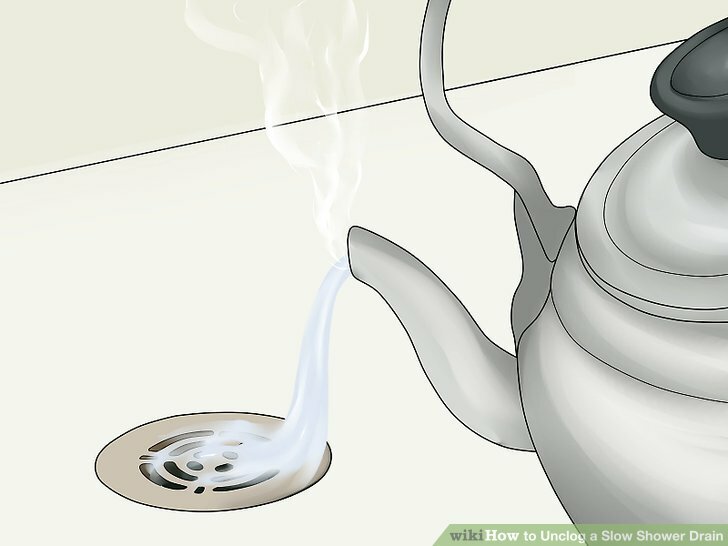 Once it’s done, pour another cup of boiling water down the drain. Once again, make sure you have CPVC or metal pipes, as boiling water may damage regular PVC pipes. Nonetheless, most houses built to code should have pipes that can withstand boiling water. 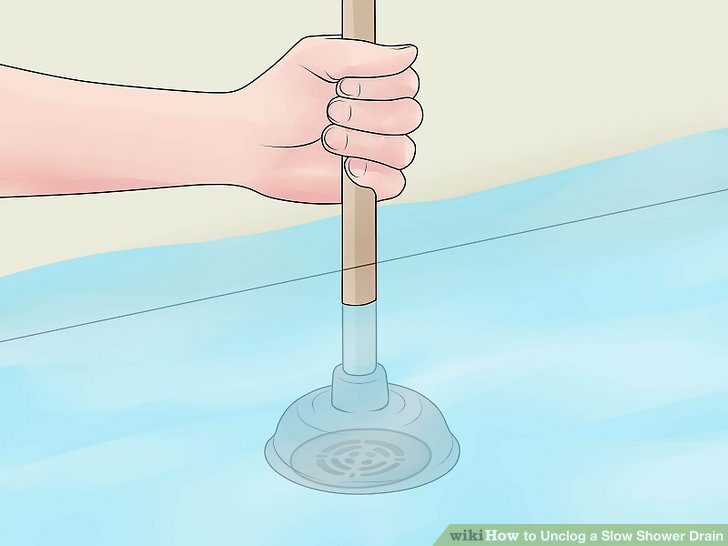 Help unclog the drain with a toilet plunger. Tape over any overflow holes with duct tape, so you can get a better seal. Put water into the tub to cover the bottom of the plunger. If there is already standing water that is draining slowly, you can use that instead of adding more water. 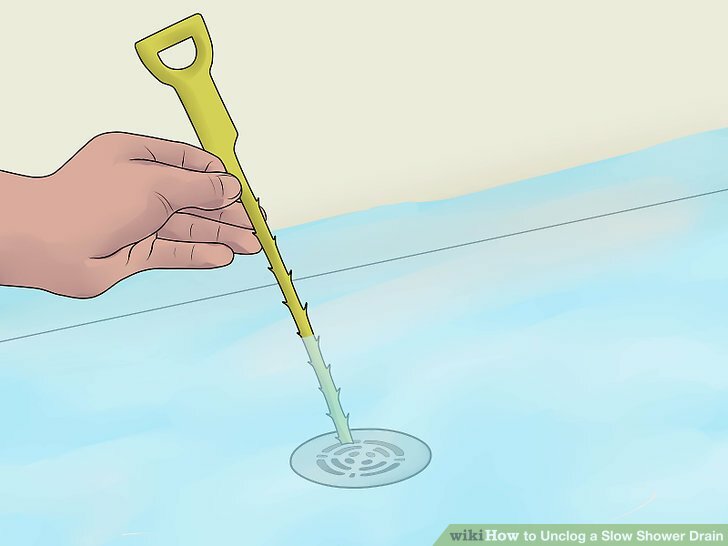 Place the plunger over the drain and plunge the drain a few times, moving it up and down, much like you would in the toilet. You may want to get a plunger specifically for this purpose so it will be cleaner. However, since you’ll likely be cleaning out your shower when you’re done, putting a dirty plunger in there won’t be the end of the world. Try a drain stick first. A drain stick, such as a Zip-it, is a mini snake that can be used to remove clogs. Once you have the stopper removed, you stick the end of the stick down the drain. The barbs catch on any clogs, and you can pull them out. However, the stick is only about a foot long, so it won’t work on clogs further down. Buy or rent a snake. 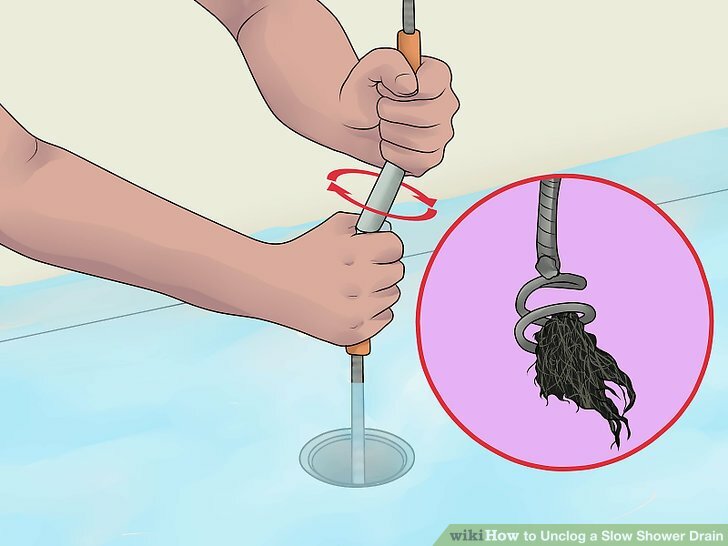 A snake, also known as an auger cable or sewer rod, is used to find clogs further down. It’s a cable that has a tip on the end to pick up clogs. You can buy or rent one at your local home improvement store to use on your drain. On a shower, remove the strainer part. On a tub drain, take off the overflow plate and go through that hole. Start threading the cable or rod into the hole. Keep going until you feel the line hit a clog, then stop pushing. Latch on to the clog. With an auger cable, latch on to it by turning the handle clockwise. That twists the end into the clog. Keep pushing, pulling, and turning to get rid of the clog. 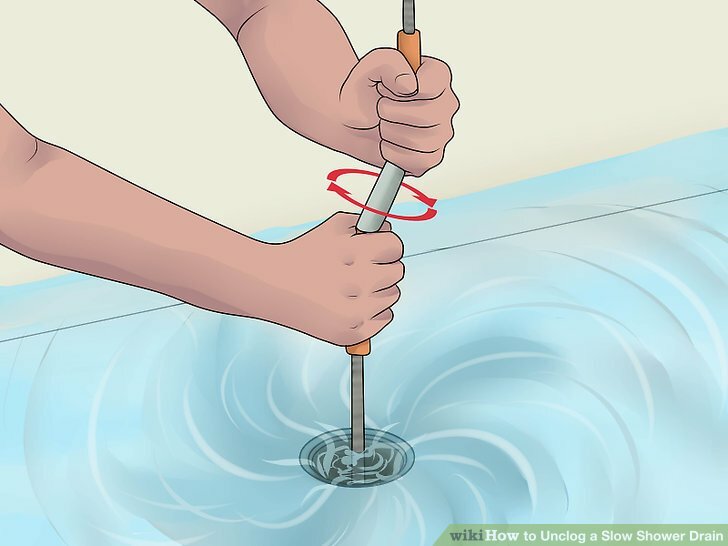 With a sewer rod, push forward and back to break up the clog. Make sure it is clear. If the standing water starts draining, that’s a good sign the line is starting to clear. 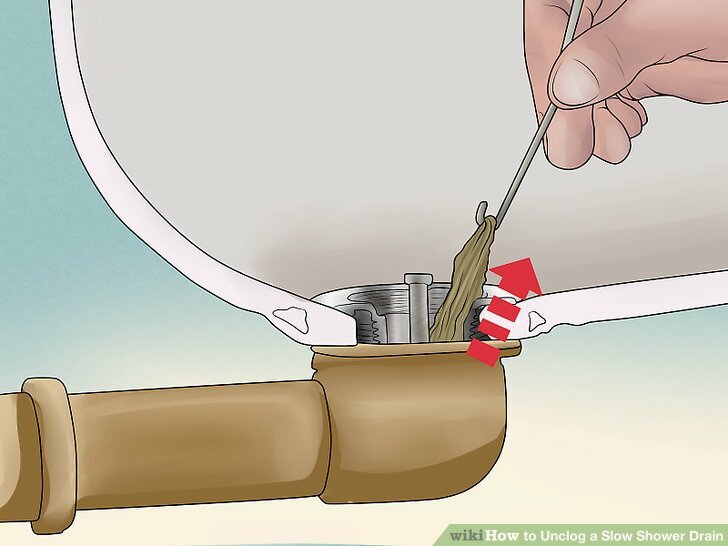 Keep working at the clog until it feels completely gone, and run some more water down it to make sure that it is draining properly and that there’s not a clog further down the line. If there’s a clog further down the line, you may need to feed in more rod or cable to clear that clog out. Pull out the rod or cable. Once you’re sure the line is clear, wind the rod or cable out of the pipe. Run some hot water down the pipe to ensure you are completely clear, and then replace anything that needs replacing, including the shower drain. Wind up the pipe and return it to the store or put it away. Take measures to prevent buildup in drains. 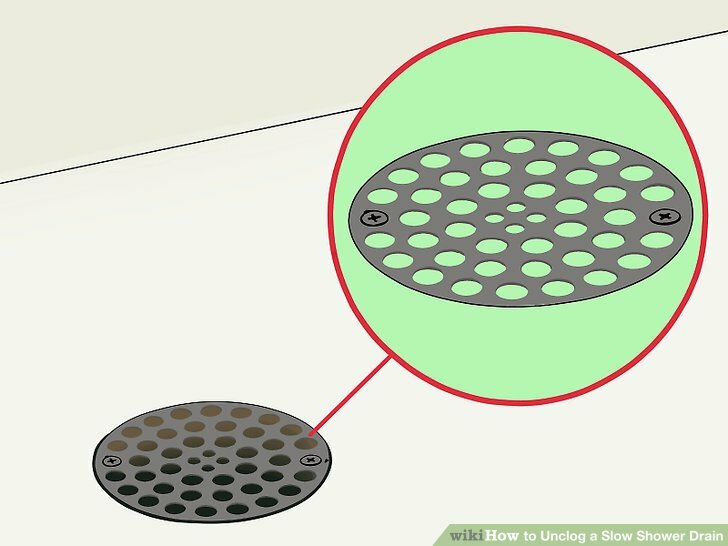 Use strainers to minimize the chance of hair entering the drain. These strainers just fit over the drain and catch hair before it goes down to where you can’t get it as easily. You can purchase strainers from a hardware store near you. However, you do need to clean out these strainers regularly to keep your shower draining properly. 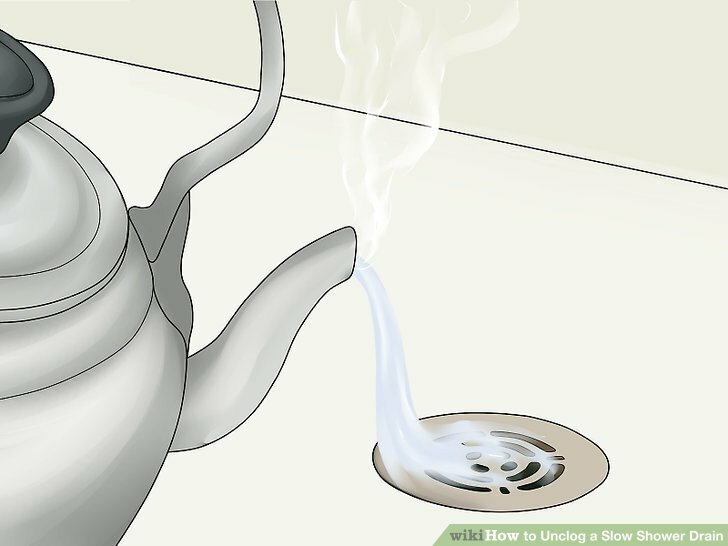 Flush your drain with hot water. Run hot water down your drain every time you use the shower or bath. This process will allow fresh build-up to be washed away, reducing the chances of prolonged buildup sticking to your pipes. You can also use a baking soda flush once or month or so. 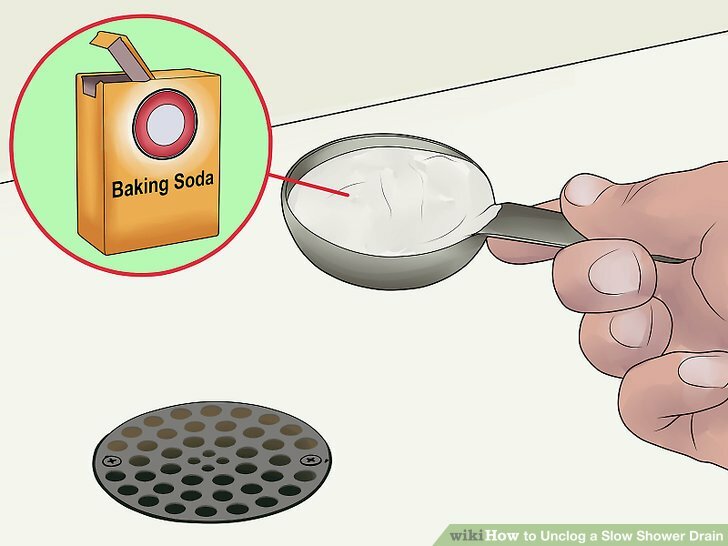 Simply start by dumping a cup of baking soda down your drain. Follow that with a cup of boiling water. Doing so can help keep clogs from building up.